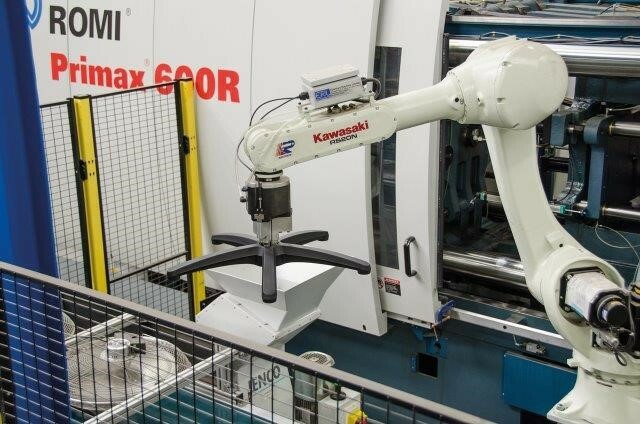 After a gap of more than 20 years, leading supplier of components to the office furniture industry, Suscom, has recommenced in-house UK production of bases using two 600 tonne Romi presses with product handling and assembly of castors managed by three Kawasaki robots. Kawasaki Robotics’ systems integrator, Evershed Robotics was tasked with design and installation of the complete cell which was purpose designed around the new tool designs. 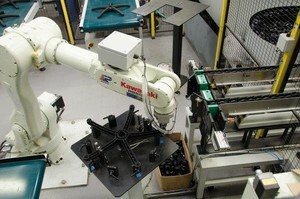 Cell control is managed through the Kawasaki robots’ integrated K-Logic PLCs with each mould tool having its own control box to select the correct programme. 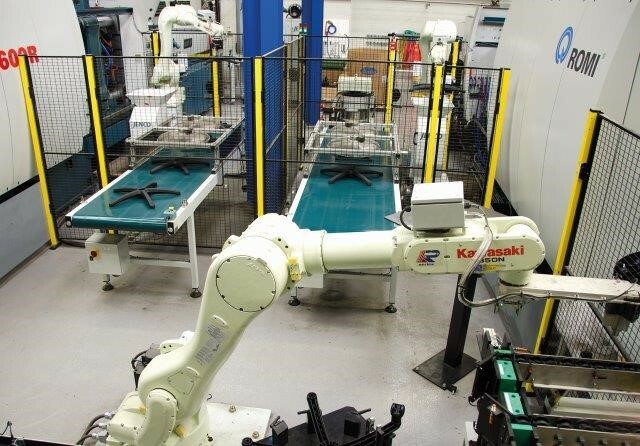 Each Romi press is served by a Kawasaki RS-20N robot which picks the completed moulding and sprue from the mould ejector pins. The new tooling design allows for the sprue to be detached by the tool but to be retained for collection along with the chair base moulding. The robot delivers the sprue to a granulator for recycling and a check to ensure that the sprue is detached from the moulding. 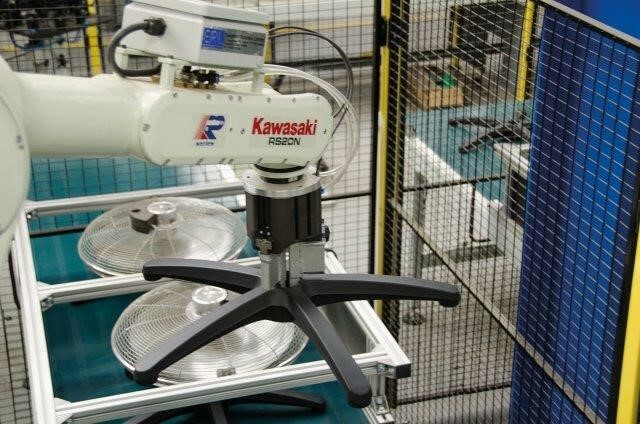 Placing the chair base onto a cooling conveyor the same Kawasaki robot then picks up a slip ring, delivered by bowl feeder, which it assembles into the centre of the moulding. Each Romi press has its own robot and conveyor delivering mouldings to a single Kawasaki RS-50N robot. This third robot unloads chair bases from the cooling conveyors and places them firstly into a turnover jig and then into a castor assembly cell. Castors can be one of two sizes so the programme ensures the robot is instructed to pick from the correct bowl feeder. After moving to a check point that confirms the correct size has been picked the robot then presses the castor into one of the five location points. 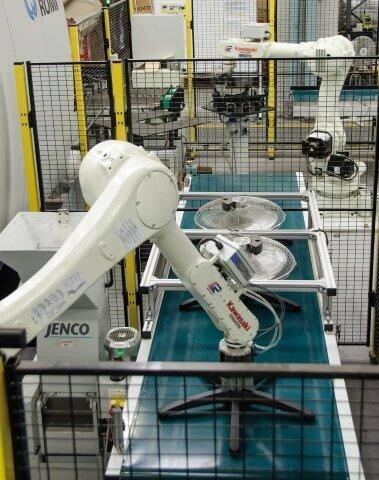 On completion of castor assembly the robot picks up the assembled base and places it onto another conveyor where it is finally unloaded manually. 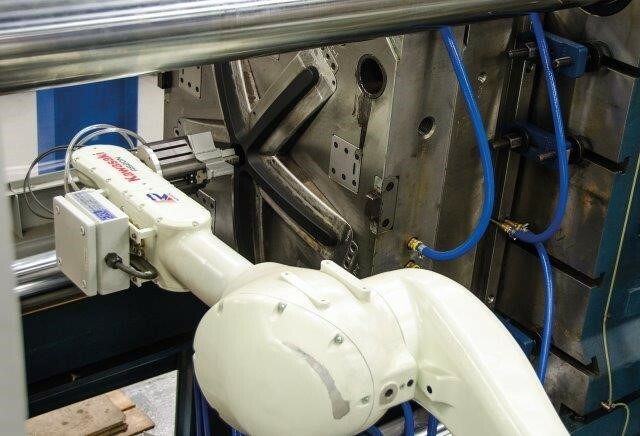 Joel Rockwood, Suscom Industries production manager believes that developing a new chair base, designed for automation, has given Suscom a far better product than the currently available generic designs. “Unlike generic imports, mouldings that come straight from our new tooling require no further coatings or fillers, there are no surface imperfections, and they are overall a much stronger product.